I am a singer, a Tenor, who sings International songs in nine languages: English, Italian, German, French, Spanish, Russian, Yiddish, Hebrew and Latin. I also sing Operatic arias, Operettas, Standards, Broadway Hits, Old Time Favorites and in sing-a-long sessions. I am the Director and Tenor Soloist of the Cantanti Singing Ensemble. We present classically trained singers and instrumentalists in Festivals of various themes [Italian Festivals, Spanish Festivals, Irish Festivals, German Festivals, Jewish Festivals and Festivals of other ethnic groups and themes. We also sing and play in restaurants, auditoriums, community centers and other venues where people gather for musical entertainment. Donato is a delight and GOD given talent! Donato was a big surprise to our family guests! They all have been raving about our Dinner party! the highlight of the evening!!! Great fun, what a laugh! Donato was very entertaining. Everything went really well, lots of good cheer and Christmas songs. Great atmosphere. Thank you. It was a pleasure meeting you and your guests. I appreciated your setting the appropriate atmosphere for fun, laughter, conversation and music. I had a most delightful time singing and entertaining your wonderful guests. Donato did a house call for a coworker out with an injury - it was just what the doctor ordered for cheering up him and our team. Thanks Donato! It was my mother's birthday and I wanted to offer her a moment where she would be the star and feel our love. Mr. Soranno knew exactly which songs to sing, and made her birthday "the best birthday she's ever had". He and his pianist mesmerized everyone. It was a unique special evening thanks to Donato Soranno and his pianist, Jeff. I wish to express my heartfelt thanks to both of them. Mr. Soranno was very polite, friendly, punctual, and easy to work with. Great performance. Absolutley terrific. Donato sings with the passion that makes these beautiful masterpieces so meaningful in our lives. A true pro, who has exceptional presence and exudes joy! 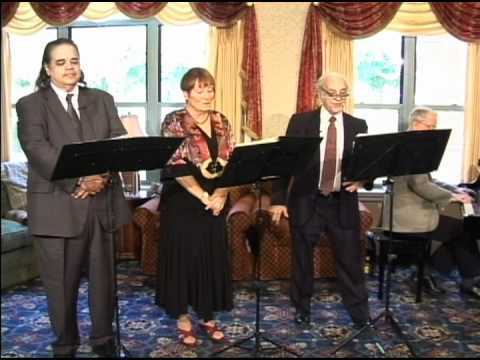 I am a singer, an Italian Tenor, who sings Opera; International songs in nine languages: English, Italian, German, French, Spanish, Russian, Yiddish, Hebrew and Latin; Operettas, Standards, Old Time Favorites and sing-a-long sessions. I am accompanied by a pianist or an accordionist. I performed in Italy and in America singing leading roles with with opera companies. I am a frequent performer in the Washington, DC and Baltimore area. I have performed in numerous concerts and in a variety of venues. I am a recording artist who has numerous CDs and Video containing hundreds of songs I sing. These CDs and DVDs are also on Internet for anyone in the world to hear and purchase. I teach a course in Opera Appreciation that highlights more than 400 years of opera in the world. As a TV producer, I present a weekly series of music videos which present my live performances of numerous concerts .